I'm sort of annoyed by the idiot comment before mine. This is beautiful, Urf. The colors are completely brilliant. I sent a link to this photo to a friend of mine who does henna tattoos. He's done my palms several times for various occasions. He's pretty well versed in symbolism from different countries, healing properties of henna on the soles of the feet, etc. i see this everyday in my neighbors. i am always amused by the intricate designs that they come up with. 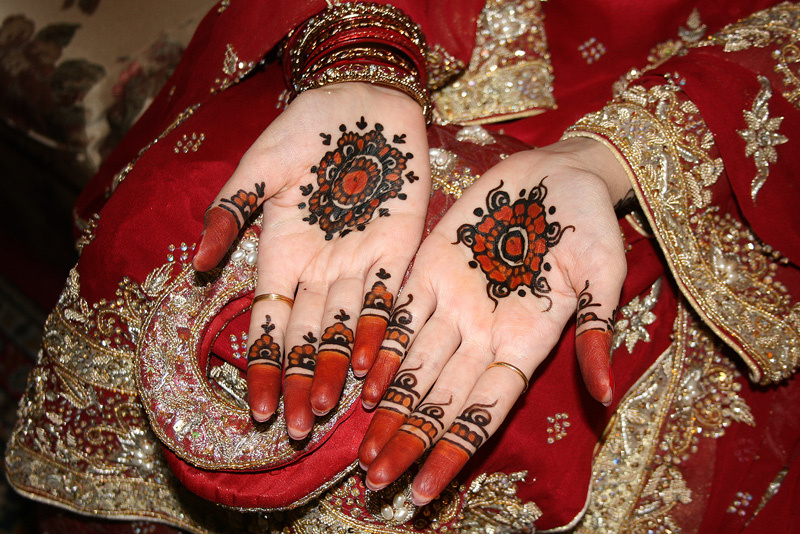 This one on her palm is lovely, but i tell you, the most beautiful patterns are usually at the back of their hands. Really lovely. Hands are painted for a marriage? Very nice! Wonderful red colors! The nice paintings fits very well with the dress, but that's not a coincidence, I suppose. Proudly hosted by Sargasso Networks. Current Server Time: 04/25/2019 07:46:42 AM EDT.